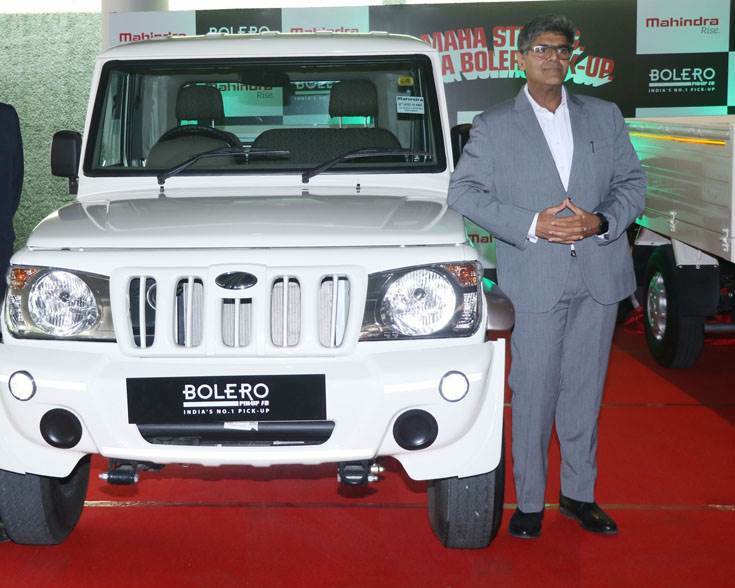 Three weeks after Autocar Professional revealed news about Mahindra & Mahindra plotting a new 1.7-tonne variant of its high-selling Bolero pick-up, the company today launched the Mahindra Bolero Pik-up. M&M says it is the first pick-up with 1.7-tonne payload capacity. The new range of Maha Bolero Pik-up gets all-new interior and improved seating comfort with a wider co-driver seat. The Maha Bolero Pik-up flat-bed has been launched at an introductory price, starting at Rs 666,000 (ex-showroom, Pune). The new Bolero Pik-up comes with an extra-long cargo deck with a length of 9 feet (2765mm) – the highest in its category – which complements the highest payload carrying capacity of 1,700kg. The Maha Bolero Pik-up comes with a double-bearing axle, stronger 9-leaf suspension and wider 15-inch, 12PR tyres to support the increased load carrying capacity. The vehicle also gets twin-tandem booster LSPV brakes and a stronger body and chassis which M&M says make it suitable for carrying heavy loads across the country. The Maha Bolero Pik-up range consists of different body styles, cargo box lengths and varying payload capacities of 1,300kg, 1,500kg and 1,700kg, suitable for various customer segments and their needs. Veejay Nakra, Chief – Sales and Marketing, Automotive Division, Mahindra & Mahindra at the launch of Mahindra Bolero Pik-up in Pune. Speaking on the new product, Veejay Nakra, Chief – Sales and Marketing, Automotive Division, Mahindra & Mahindra said, "It has always been our endeavour to raise the bar in the pickup segment and provide the best customer value. The Maha Bolero Pik-up provides unprecedented earning potential with its category best 1,700kg payload and 9-foot-long cargo box. This Maha Bolero Pik-up will further enhance the core values of Mahindra’s tough and rugged DNA, enabling higher earning potential with lower maintenance costs, and take the brand to the next level”. The newest Mahindra small CV also gets 2 years of free maintenance and a Rs 400,000 buyback guarantee after 4 years. M&M, which claims a 62 percent market share (YTD September 2018) in the pick-up segment, has the widest portfolio in pick-ups to cater to the various needs of cargo transportation. The company has be the first to introduce a flat-bed cargo pickup, double-cabin pickup, AC pickup, CNG pickup and the first micro-hybrid pickup.